We're so honored that so many people are keen to share IntakeQ with friends and colleagues! 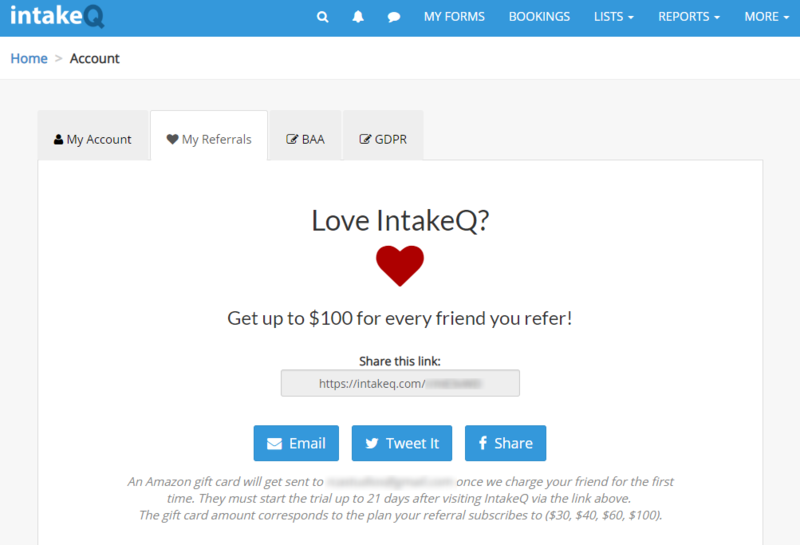 As a small and heartfelt thank you for those who recommend IntakeQ to others, we have a referral program to return the love. In order to view this offer, please log in to your account and navigate to "More > Account > My Referrals". This page shows your unique referral link that should be sent to your friends and shared on social media. When someone uses that link to sign up for a trial, they will show up in your list of referrals. You will be credited for each client that converts from trial to subscription.